NARRAGANSETT, R.I. -- The vision came to him in a dream. And it was so powerful that Joseph Peace Hazard had no choice but to build the stone mansion, not for his own residence but as a place where someone else might find shelter, a place he would name ``Druidsdream." The striking home, dating from 1884 and built from stone quarried on the property, has made its way onto the National Register of Historic Places and today operates as a bed-and-breakfast, The Richards, run by Steven and Nancy Richards. It's not easy to find. Set back from the road in a residential neighborhood, it has no sign. On a Friday evening a friend and I drove up and down the street several times, finally resorting to a cellphone call, which had Nancy Richards waiting out front to flag us down on our next pass. Once inside, we were intrigued by the luggage elevator, a white metal mesh cage with gold-colored accordion doors; we stuffed our duffel bags in, Richards turned the key, and we kept pace with our bags on the wide staircase. Everything in this 8,500-square-foot house is big: The ceilings are high, the hallways are spacious, and the banisters are wide. Common rooms on the first floor include a stunning dining room overlooking the gardens and filled with Richards's auction finds, including an oriental rug, an English sideboard from the early 1800s, and a gilt-framed mirror that once hung in a Newport mansion. Glass and ceramic balls in different sizes, colors , and patterns fill bowls and baskets on the window sills and show up massed together in the book-lined parlor . Her collection of dragons adds a whimsical touch. We were surprised by the absence of a television in the house. Though we frequently encounter TV-free guest rooms in New England bed-and-breakfasts, there usually is one in a common area. Our second-floor room had a four-poster queen bed with a crocheted canopy and a day bed, made up with sheets at our request. Plaids and big floral prints in salmon and yellow contrasted nicely with the soft lemon walls. Area rugs covered a wood floor. There were two upholstered chairs and three bright lamps to read by. All the rooms have fireplaces, but regulations imposed after the deadly Station nightclub fire prohibit their use, Richards said. Our large, private, L-shaped bath with a shower was down the hall. The cabinet contained an unusual mishmash of toiletries: everything from shower gel to suntan lotion, including two dispensers marked simply ``shampoo" and ``conditioner." Next to the bathroom we had access to a guest refrigerator, and just outside our room was a rack of brochures on area attractions . We're all for neighborliness, but it bothered us that there was no lock on the bedroom door, nor was there any way to indicate if we did not want to be disturbed. Breakfast is served family style at precisely 8:45 a.m. We enjoyed coffee and juice, fresh strawberries, muffins, pancakes, and bacon one morning, and an egg-and-cheese strata the next. Near the end of breakfast the first morning I asked Richards if she might have some instant decaf coffee available. The next day there was a pot of brewed decaf on the sideboard. Fellow guests Liz and Josh Kaminetz of Philadelphia, who were in Narragansett for a wedding, raved about the distinctive architecture and the grand scale of the stone mansion. ``We especially loved hearing about the history of the house and the stories behind all the interesting pieces Nancy has collected," Liz Kaminetz said. For dinner, Richards recommended the Coast Guard House, a Narragansett institution on the ocean. On a rainy night we looked out onto a smooth rock beach that could have been in Maine. A large second-floor deck is used for outdoor dining in good weather. The specialty is seafood, from broiled scallops to ahi tuna, but there's a good selection of steaks as well. Entrees run $14-$29. 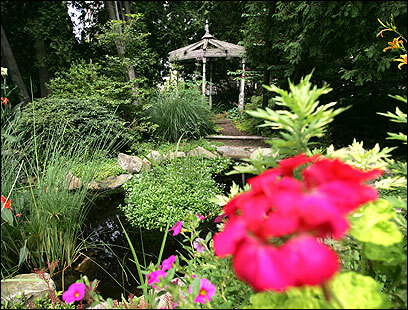 One of the pleasures of a stay at The Richards is meandering the gardens on the 1 1/2-acre property. There's a white garden, a water garden with koi, and a lovely shade garden. A half-mile path through the woods and across Ocean Road leads to a rocky ocean view. Beachcombers can walk, bicycle, or drive to Narragansett Town Beach, less than a mile away, though it's pricey at $5 per person plus $6 to park. Richards also sends guests to Scarborough Beach, a little less expensive and just as lovely. Contact Ellen Albanese at ealbanese@globe.com.